Mad Love: Harley Quinn's origins get a deep dive in the new DC novel – AiPT! Harley Quinn’s re-introduction by Dini and Cadigan as a woman with agency makes her an anti-hero for new generations. Since her first appearance in Batman: The Animated Series in 1992, Harley Quinn has been a fascinating character in the DC Universe, constantly reinterpreted to fit the time, the author, and the cultural need for a female anti-hero. At times a brilliant psychiatrist twisted by desperate love, other times a violent femme-fatale, Harley has featured prominently in stories both on screen and in the 4-color pages. 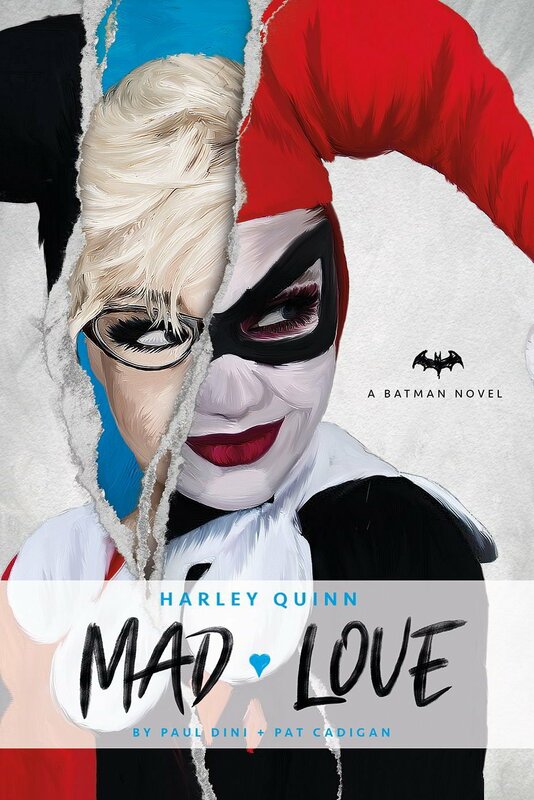 In Mad Love, authors Paul Dini — the original creator of Quinn — and Pat Cadigan take the motley heroine and explore what would truly drive such a gifted scientist into the arms of a fiend like The Joker and send her down a path to villainy. The journey, as ever, is always more fascinating than the destination. The “origin” of Harley Quinn has been explored in different mediums, most recently in Suicide Squad, but reconciling how a brilliant psychiatrist can be so easily manipulated by The Joker has remained a bit of comic book hand waving. Why was such a young doctor assigned the the Crown Prince of Crime? Why would she go from being a dedicated doctor to a maniac tearing around Gotham City? Is she a victim or a villain? Dini and Cadigan start with Harleen’s childhood and family, focusing on a traumatic incident involving her father and the New Jersey mob. Her distrust of the police begins here, blending into the idea that the existence and tolerance of Batman, a vigilante allowed by the corrupt police department to openly defy the law, was part of the problem. The desire to work with the worst of the criminally insane stems from a similar place. How could Gotham consider these people to be irredeemable? How does locking them in a place with no hope of release help to rehabilitate these men and women? Her fearlessness in the face of even Killer Croc instantly gives Dr. Quinzel credibility in Arkham and gathers the attention of the man locked away in the deepest basement of the prison: The Joker. One major consistent through line in the book is Harleen’s belief that some good can be found in anyone. She starts group therapy with a group of women including her longtime comic partner Poison Ivy. Even after it backfires, she sees the potential for positive outcomes in working with the inmates rather than simply locking them away until they inevitably escape. Having criminals dropped at Arkham’s door, bloodied and beaten by the true villain, Batman, doesn’t help matters. Slowly but surely, Harley’s obsession with rehabilitating The Joker sends her down a dark path. He is a predator and knows every button to push, every string to pull to convince the good doctor that he is the victim. He wants to be better, he wants to get help and only she can rescue him. The manipulation of Dr. Harleen Quinzel is so complete and airtight that, once it begins, there truly is no escape for her. With her own past history used against her and the need to succeed pushing her further and further down the spiral, Harleen eventually succumbs to the master manipulator, helping him escape Arkham and acting unwittingly as his patsy. Snapping after the blame she receives for Joker’s escape, including from the hated Batman, Harleen finally embraces her childhood nickname and becomes the dangerous woman we all know and love: Harley Quinn. There is no physical transformation, no chemical bath, just a costume, a deep knowledge of martial arts and explosives, and an overwhelming obsession with The Joker. Dini and Cadigan really could have wrapped up the story here and allowed our collective comic-book and screen knowledge of Harley fill in the gaps. Instead, they spend time exploring the abusive dynamic between the pair. Joker becomes tired of his plaything, but Harley is too far down the rabbit hole to resist. This, for better or worse, is where Harley Quinn was when she first appeared in Batman: The Animated Series: an abused sociopath dedicated to her love of The Joker and her hatred of Batman and authority. With no resolution, this would be like an extended version of the club scene in Suicide Squad. In an era where Harley has seen success in her own solo titles and in major motion pictures, there is no way it could end here. Not now and not ever again. Harley doesn’t go back to being Harleen. She doesn’t get saved by her capture and stay at Arkham. She gets help. The help that she so desperately wanted to give Ivy and Baby Doll, finally gave her a chance at emancipation from Joker’s machinations. Their final encounter is quite satisfying. Harley Quinn is one of the most beloved Batman characters across all media. Her story began simply but has grown in scope and popularity like few other modern comics creations. With Margot Robbie’s recent portrayal and her future promoting the character in film along with the acclaimed comics run by Jimmy Palmiotti and Amanda Conner, Harley is the perfect character to introduce in DC’s new line of novels. Her re-introduction as a woman with a background story and with agency makes her an anti-hero for new generations. Harley gets a backstory and actual agency!